Happy Thanksgiving eve! And hooray for a holiday that celebrates food, community and gratitude. In case you’re still tailoring your recipes, here’s one way to wow tomorrow’s crew: change up the traditional apple pie. Add rosemary. It rocks. I first made this almost a year ago, for a holiday party. Although I thought the latkes were the star, I had several thumbs-up responses for the pie, a recipe I made up entirely. 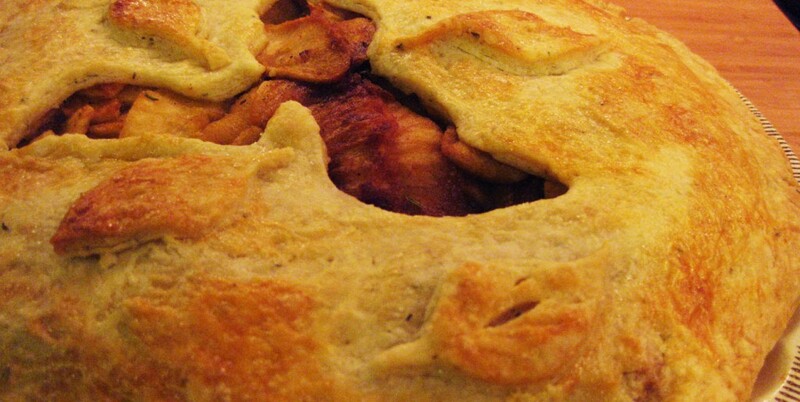 I’ve since found other recipes for rosemary apple pie. 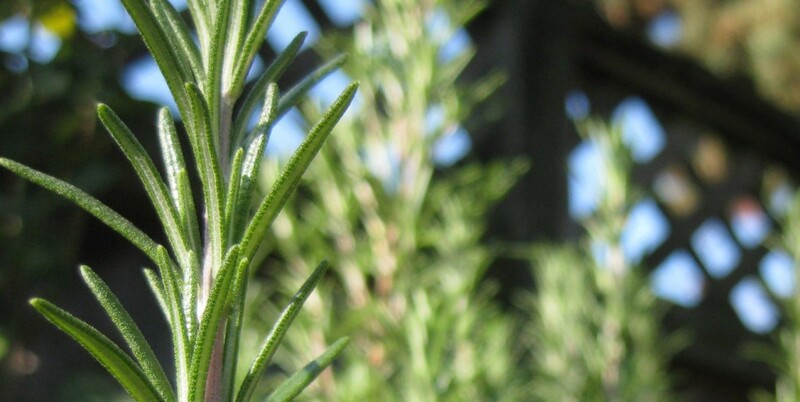 But most make a rosemary simple syrup and use cream, too. Me? I just chop up some rosemary. Avoid the extra sugar and fat. It was a friend’s birthday this weekend. Actually: birthdays for TWO friends. And Ken suggested we make that pie. I admit, I thought about buying a pre-made crust to save time. But he looked at me — the look I get if I haven’t properly recycled something. And I knew we were making crust from scratch. 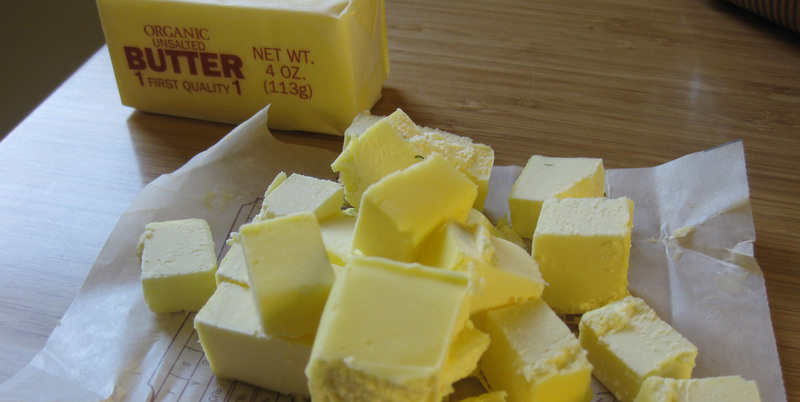 You heard me: lots of butter. The freezer is your friend. My great grandmother taught me this. Put all your crust ingredients in the freezer — and your bowl/food processor — for at least 15 minutes before you start making the crust. And your butter should be frozen, too. And once you’ve divided the dough for two crusts, freeze again. Keep the pie plate in the freezer, too. Apple cider vinegar. I’m told this helps with the flakiness of the crust. Substitute 2 tbsp of your ice water for vinegar instead (also cold, mine was even icy!). And then there’s the filling. What’s the secret there? Cook your apples first. Oh yes. The trouble with apple pies is that they bleed. You cut a slice and all the liquid rushes out. 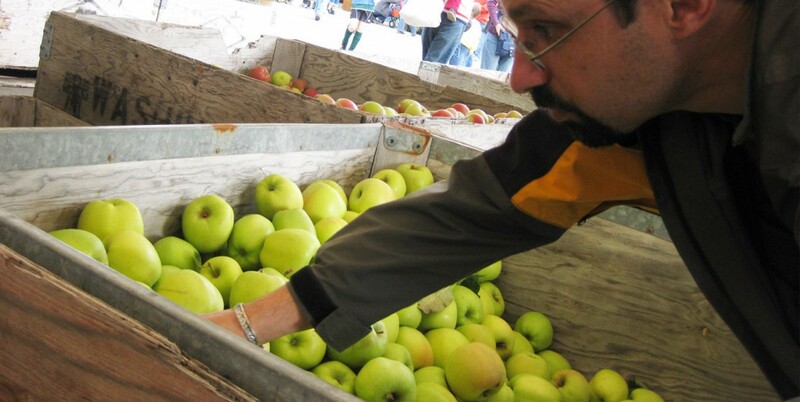 How do you keep nice gooey apples and eliminate extra liquid? 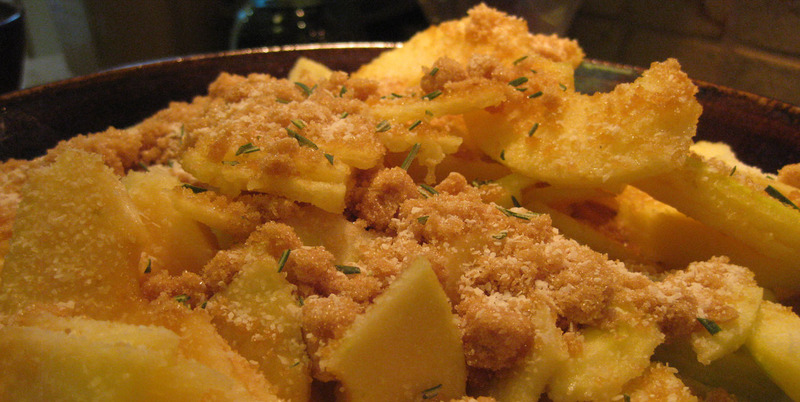 After you’ve tossed the apples in lemon, sugar, salt, nutmeg and rosemary, cook the apple slices before dumping it into the pie shell. I know. This takes forever. I never said it was a quick pie. But it’s a great one. Not too sweet. Lots of flavor. 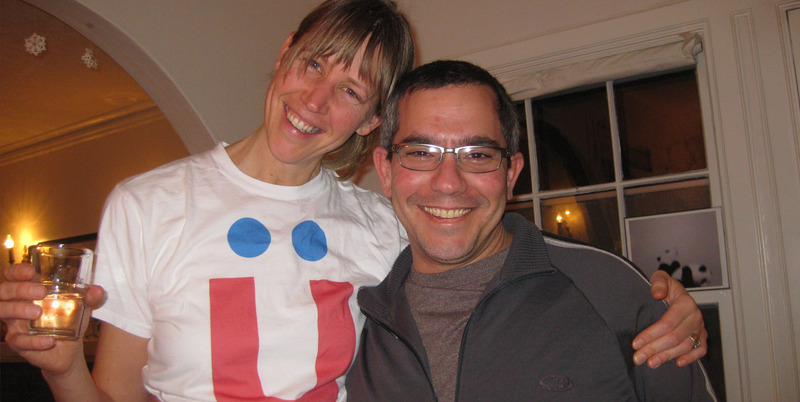 The important part: It made the birthday duo happy. And I’m quite thankful for that. Rating: 5 of 5 glasses of cider. Although I realized I forgot to add cinnamon. But clearly it’s ok either way. I know I keep rating things 5 lately. But it’s the holiday, yo. We’re breaking out the good stuff. And so should you. Measure out all crust and mixing ingredients and place in the freezer for 15 minutes. Place the food processor bowl back on the motor with the blade, carefully. 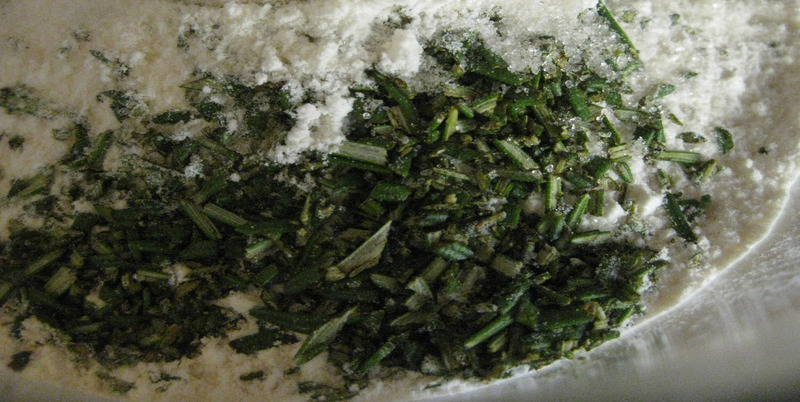 Combine flour, salt, sugar and rosemary in the food processor. Mix. Add the vinegar and pulse to mix. Add one tablespoon of water at a time, pulsing to incorporate, until the mixture begins to clump together. It’s at this point that I transferred to a bowl. Add water until the dough holds together without being overly wet. Dough should be slightly crumbly, but hold together when pinched. If too wet, add more flour. 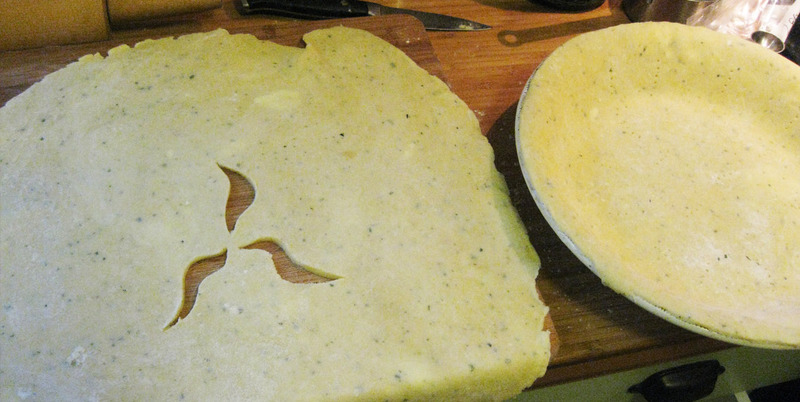 Divide the dough into two equal parts and gently shape into two flat round discs. Wrap in plastic wrap and refrigerate, or place in freezer for a shorter time period, for at least one hour. Toss apple slices in lemon. Add sugar, nutmeg, salt, rosemary and vanilla. 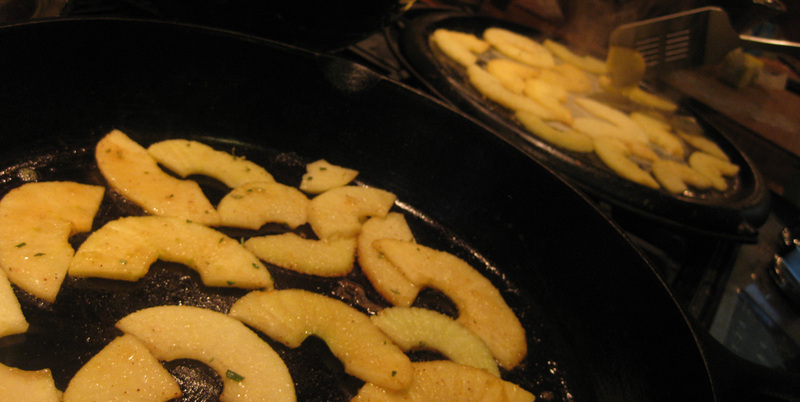 Cook the slides in a large skillet. Over medium heat, melt butter in the pan (small amount), and cook the slices and flip until they caramelize. Don’t crowd the slides in the pan. Place in a bowl. Keep doing this with all the apples. Keep any liquid that’s left at the bottom of the bowl(s). Place a 9″ pie plate in the freezer. Remove one dough disc from the refrigerator and let sit at room temperature until lit’s easy to roll, but still chilled. Lightly flour your work surface and roll dough out to a 12″ circle, between 1/8 – 1/4″ thick. 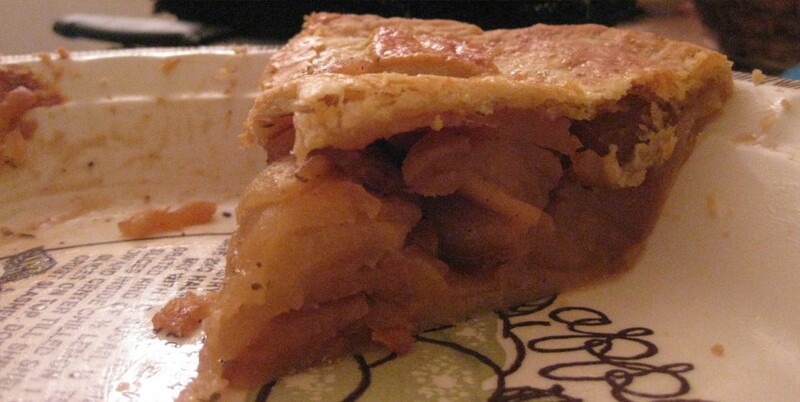 Place in the bottom of the chilled 9″ pie plate. Trim edge at pie plate rim. And prick bottom with fork. Return to the refrigerator to chill. Remove second dough disc and roll out to a 12″ circle on a lightly floured surface. Decorate and cut air holes, if desired. Take out pie dish. Pour in cooled apples and any remaining liquid. Place top dough on top of the apples and pinch the top and bottom dough edges together to enclose the apples. Beat the egg in a small dish and mix in cream. Lightly brush the egg wash over the top of the pie and along the edges. Sprinkle with coarse sugar. at 400 degrees Fahrenheit for 30 minutes. Cover edges with aluminum foil if browning too quickly. Continue to cook in 7 minute intervals, as needed, until the crust is golden brown and flaky. This entry was posted in 5 Wine Glasses, Dessert, Vegetarian and tagged apple pie, baking, rosemary, rosemary apple pie, Thanksgiving. Bookmark the permalink.